DO-90002-01 was succesfully added to your cart. Simultaneously displays temperatures and time. Wire mounting bracket permits easy probe placement. 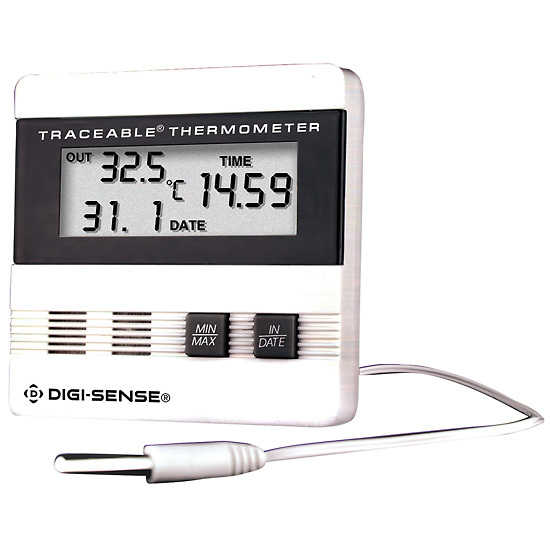 Ideal for monitoring temperature in the lab, home or office. Thermometer includes a remote probe with 6-ft (1.8m) cable to measure outdoor temperature and an internal sensor to measure indoor temperature. Display can be changed to show probe or ambient temperature, time of day, and month/day Thermometer can also display the exact time and date when the minimum and maximum temperature occurred. The temperature sensor performs accurately in most environments even including under water. Use rear stand to place unit on table or attach to wall via Velcro® strip or the two rear-mounted screw holes. Model 90002-01 is designed for general-purpose applications. We use to monitor min-max variations of temperature of incubators.